Collection Allard and Nol (acquired from the artist circa 1895). P. Chavane, Paris; sale, Htel Drouot, Paris, 17 December 1906, lot 38 (illustrated; as La chaste Suzanne). A. Renan, Gustave Moreau, Paris, 1900, p. 34. 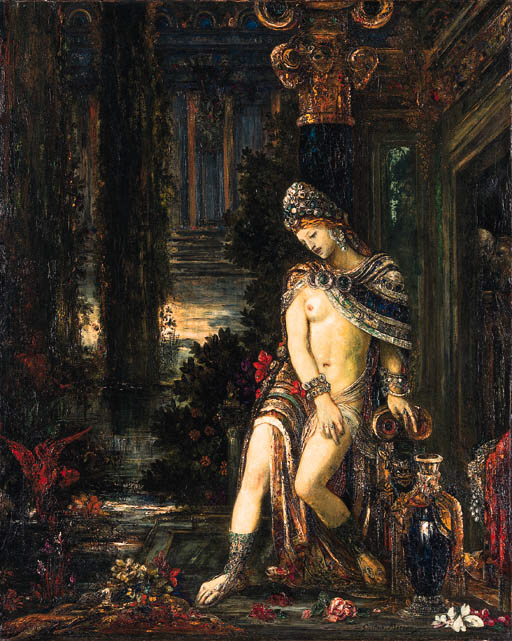 P.-L. Mathieu, Gustave Moreau, Complete Edition of the Finished Paintings, Watercolours and Drawings, Fribourg, 1977, pp. 178 and 377, no. 419 (illustrated in color, p. 227). Consult the masters. They advise us not to impoverish art. They have always introduced into their pictures whatever they knew to be richest, most brilliant, most rare, most strange at times, whatever around them was considered most precious and magnificent... And everywhere on the walls of museums how many windows there are, openings on artificial worlds seemingly carved in marble and gold and on spaces necessarily chimerical (A. Renan, "Gustave Moreau," Gazette des Beaux-Arts, July 1886, p. 43). What Renan describes as the "principle of necessary richness" (op. cit., p. 42) overwhelms the surface of Suzanne et les vieillards, and the narrative of the scene becomes secondary to the abstract nature of the overflowing wealth of reds and golds that dominate the image. Pierre Mathieu aptly describes the work, "The impasto is built up in the shape, quite literally, of cabochons designed to bring out the cool, glowing greens and blues of the jewels against the golden flesh-tints. Everything around her acts as a pretext for the glorification of color, especially of the reds repeated in the flowers and in the dazzling plumage of the bird taking flight on the left" (P.-L. Mathieu, op. cit., pp. 178 and 180). A taller extant version of the same subject matter with more subdued tones represents Suzanne standing, covering herself as she becomes aware of the elders to her left (Mathieu, no. 420). Moreau's place in the development of nineteenth century European painting is complex. A forerunner of the Symbolist movement, the didactic nature of his subject-matter classifies him as an allegorical painter. Accordingly, Gauguin, another precursor to symbolism, and the Nabis reproached the artist for being too literary in his preference for "the richness of material things to the promptings of the heart" (P. Gauguin, Oviri: Ecrits d'un sauvage, Paris, 1874, p. 61). Mathieu asserts that "it is from Delacroix that Moreau stems, and at the same time from Chassriau. Like them, he wished to be a history painter and a decorator... His message, which he transmitted to his pupils (such as Matisse and Marquet), lay in the imaginative use of colour and in this respect Moreau is the connecting link between Romanticism and Fauvism" (P.-L. Mathieu, ibid., p. 258).